I love my red violin. Oh no, I’m sick again. I’ve got a sinus infection and I’m so tired I can’t even think. I logged onto v.com and found that I’ve missed all kinds of interesting things, including Pocahantis (sic) and Evil Linda’s lament on the summer solstice. I don’t even have the energy to read much or to play my violin, and certainly not enough energy to go out to the gym. That’s really bad. I’ve been fooling around with Adobe Photoshop Elements and a book on how to use it. So far my biggest achievement has been taking out the effects of air pollution on the landscape in some of my photos. I wish I could take out the effects of air pollution on my lungs and other living things. I stay in bed, get up and teach a lesson, and then go back to bed. My students have obliged me by making the same mistakes they made last week, so I don’t have to deal with surprises from them. Sorry to complain so much. I want to get well soon. 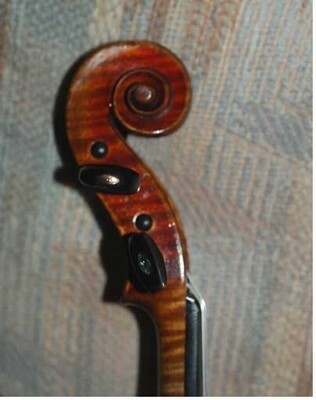 Does this violin have a gorgeous varnish or what? It was made some time around the year 1900 in Germany. It belonged to my violin teacher, who lent it to me when I was in high school. It had and still has a beautiful, warm sound. 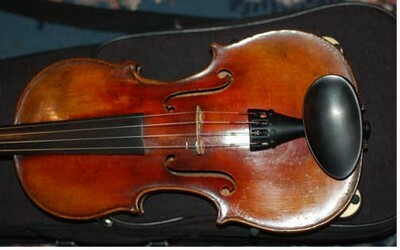 My family didn’t have enough money to buy a good violin like this. After I had played it for a few years, I told my father that I would be very unhappy when I had to give it back to my teacher. “You don’t have to give it back,” my father told me. “It’s yours now.” He had been paying my teacher a small amount of money every week for years. This violin is, in more ways than one, the greatest gift I’ve ever received. I love to read biographies and autobiographies of musicians because these people relate to almost everything through music. I just finished reading Isaac Stern’s autobiography “My First Seventy-Nine Years,” and it’s fascinating. His book is, among other things, a history of the twentieth century, a travelogue, and a portrait of many different cultures as seen by a musician. Isaac Stern’s first visit to Israel, shortly after the state was created, had a profound, long lasting effect on him. He was caught up in the ebullient spirit of the people creating a new democratic society based on humanist ideals. Their energy, hard work, and conviction that they would succeed in spite of overwhelming obstacles had an intoxicating effect on him. He was equally impressed with the Israelis’ passion for music. At every concert he gave, there were at least 250 people in excess of the capacity of the hall. Somehow, they all managed to squeeze in. Everyone was knowledgeable about music, too. Working people would stop him on his way to his hotel room to discuss the relative merits of Beethoven’s Fifth, Tenth, and Kreutzer Sonatas. He would return to Israel again and again, frequently during times of war. When Stern traveled to Japan shortly after World War II, he was fully aware that Japanese traditional music, unlike European and American classical music, is always played in the context of dance, song, or the spoken word. He was not prepared for the passion of the Japanese people for European and American classical music. There were overflow crowds at every one of his performances, and recordings of Beethoven quartets, Bach Brandenburg Concerti, and Chopin piano sonatas were played in Japanese bars. Fiddler on the Roof, sung in Japanese, was a big hit there. The conflict between traditional and new ways, expressed in “Fiddler,” was very real to the people of Japan who were experiencing the diminution of their own traditional culture at that time. On his visit to the Soviet Union during the 1950s, at the height of the Cold War, Stern broke political barriers with his music. The Soviet people were, if possible, more passionate about music than people he had played for elsewhere. When a concert hall was filled and the doors closed, the crowds outside would pound on the doors until someone relented and let them in. People of all ages, coming from all walks of life, were in the audience. (There was no need for Oprah to promote classical music there.) Stern sensed the love of music in his audience and felt that he played his very best because of it. Communist China was off limits to Americans until the 1970s, and Stern went there with his family in 1979. Relations between the Chinese and American governments had improved so much that Stern was allowed to bring a film crew with him. The Chinese people, who had not heard much Western music in years, were almost wildly enthusiastic. During the Cultural Revolution in China, from 1966 to 1977, everything associated with the West, including Beethoven, Mozart, and violins, was reviled. Musicians and music teachers were imprisoned, beaten, humiliated, and starved. Many committed suicide. Stern’s film crew shot and produced an award-winning film called “From Mao to Mozart.” Stern was convinced that music was a strong, emotional language which could bring all people together. In the final analysis, he believed, Mao could not prevail against Mozart. Isaac Stern considered himself a cultural ambassador with music as his universal ally. He was very proud that he had served so well in this role. One of my friends is an unusually kind person who is always doing her best to help other people. She was physically abused as a child by both parents every day for years. I once asked her how she had turned out so well, and she told me that it was because of her athletic coach in school. She was a jock, so she spent a lot of time working with him. He knew about her athletic skills and, more important, about her worth as a person. Just as he gave to her, she has given to others. Suzuki believed that all babies are born with musical talent waiting to be developed. He had faith in the capabilities of all his students, and he managed to communicate his faith to them. He relied heavily on positive feedback, even when making corrections. He would often say, “That was good. Now can you do it better?” For a while, he had all his students take a test at the end of the school year to determine whether they could advance to the next higher level. Of course, they all passed the test. He listened to every one of his students and wrote a personal evaluation with lots of positive feedback for each student. (Can you imagine that happening today? Perhaps someone would write a computer program which would generate sentences of praise and distribute them randomly to students.) At the recital at the end of each school year, Suzuki had each student play something that he had been studying for some time and could play reasonably well, rather than cramming something new in at the last minute and feeling nervous and unprepared. Suzuki had his students perform from the very start of their lessons. Each week, each student would give a “home recital” for the father. (The mother went to lessons and coached the student at home.) At first, the student would climb up on a small makeshift stage and bow to the father, who would bow in return. After a few lessons, the student would get on the stage holding the violin in rest position and proceed with the ritual bows. Still later, the student would play a few notes at the home recital. The bows, respect, and family all fit in well with traditional Japanese culture, but the inherent message can benefit all students. The student learns from the very start that he can do something of value which will be appreciated by his parents. He learns the rewards of working towards a goal and showing other people his accomplishments. He learns something else very subtle and very important – he has the ability to make others happy. He is a worthwhile person with gifts to bring to others. All of us – kids and adults alike – need to nurture and be nurtured by love. 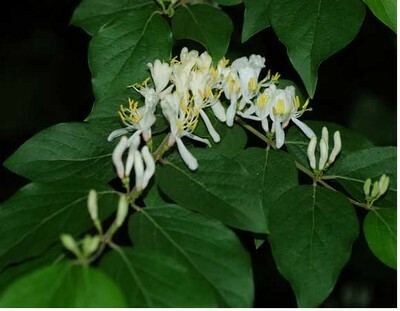 It's early June, and the sweet scent of honeysuckle is just outside of my home.